Our universe contains innumerable objects that are unevenly distributed in space, but to take an overall perspective, modern cosmology assumes that the universe is isotropic and homogeneous. 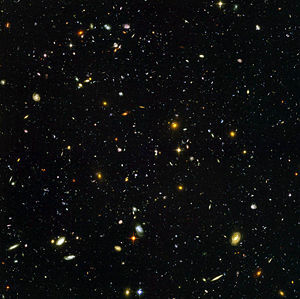 Shown here is the deepest visible-light image of the cosmos, derived from data gathered by the Hubble Space Telescope. Isotropy is a term used in various scientific disciplines to indicate that certain properties of a part of nature (such as a material or radiation) are the same when measured from any direction. Those properties are said to be isotropic. For instance, isotropic radiation has the same intensity regardless of the direction of measurement, and an isotropic field exerts the same action regardless of how the test particle is oriented. The opposite of isotropy is anisotropy, a term used when properties are different when measured from different directions. The investigation of properties, whether isotropic or anisotropic, helps us understand the nature of materials, the nature of radiation, and the nature of the universe at large. That information can then be used to develop various applications. For instance, investigation of the isotropic and anisotropic properties of materials helps with decisions to be made when materials are needed for construction projects. The universe is isotropic—that is, it is the same in every direction. The universe is homogeneous—that is, it is the same at every location. These two assumptions are part of the Cosmological Principle, and they are supported by investigations probing the large-scale structure of the universe and analyses of the cosmic microwave background radiation. In radio broadcasting, an isotropic antenna is an idealized "radiating element" used as a reference—that is, an antenna that broadcasts power equally (calculated by the Poynting vector) in all directions. In practice, an isotropic antenna cannot exist, because equal radiation in all directions would be a violation of the Helmholtz wave equation. The gain of an arbitrary antenna is usually reported in decibels relative to an isotropic antenna (with its units expressed as dBi or dB(i)). Optical isotropy means having the same optical properties in all directions. If one needs to calculate the macroscopic reflectance or transmittance, the individual reflectance or transmittance of the domains is averaged. This can be verified by investigating, for instance, a polycrystalline material under a polarizing microscope having the polarizers crossed. If the crystallites are larger than the resolution limit, they will be visible. In studies of the mechanical properties of materials, the term "isotropic" means having identical values of a property in all crystallographic directions. Heat conduction by most materials is anisotropic, but for some materials it is isotropic—that is, independent of spatial orientation around the heat source. When one considers the strength of materials, metals and alloys tend to be isotropic, but materials such as wood and fiber-reinforced composites are very anisotropic, being much stronger along the grain/fiber than across it. The investigation of such properties helps with decisions to be made when materials are needed for construction projects. If the properties of the cell wall are more or less the same everywhere, it is said to be isotropic. The interior of the cell is anisotropic due to intracellular organelles. In skeletal muscle cells (or muscle fibers), the term "isotropic" refers to the light bands (I bands) that contribute to the striated pattern of the cells. Isotropy is also a concept in mathematics. Some manifolds are isotropic, meaning that the geometry on the manifold is the same regardless of direction. A similar concept is homogeneity. A manifold can be homogeneous without being isotropic. But if it is inhomogeneous, it is necessarily anisotropic. ↑ Curious About Astronomy: What do "homogeneity" and "isotropy" mean? Retrieved November 26, 2007. Anisotropy and Isotropy NDT Resource Center. This page was last modified on 9 March 2018, at 18:07.